When the non-profit Christopher Street West organized the first-ever permitted parade advocating for gay rights back in 1970 (in response to the Stonewall Riots that had taken place in New York the year prior), the country was a very different place when it came to LGBTQ equality. While we’ve come a long way, we also know that there’s still work to be done given the current political climate. Pride events now take place around the world to help raise awareness about equality and inclusion... and also happen to always be fun and fabulous parties. (We’re almost positive no one has ever walked away from a Pride festival thinking “Well that was kind of boring.”) And, of course, the bash right here in West Hollywood is no exception. 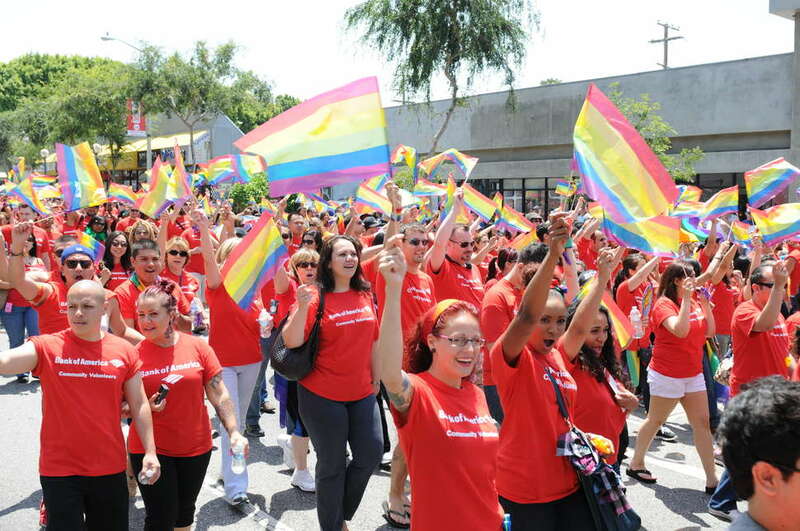 While June is Pride Month, LA Pride Week events kicked off June 1, and the 2018 LA Pride festival will be going on all weekend, the absolute highlight is always the free, fabled, and float-filled parade that takes place this Sunday. Here’s everything you need to know to get in on the over-the-top celebration. Where and when does the parade start? San Vicente Boulevard is closed between Santa Monica Boulevard and Melrose Avenue the entire weekend, through 10am Monday. Santa Monica Boulevard is closed from Fairfax Avenue to Doheny Drive from 5am to 5pm on Sunday. Streets one block north and south of Santa Monica Boulevard is closed from Fairfax Avenue to Doheny Drive from 5am to 5pm on Sunday. Crescent Heights Boulevard is closed from Romaine Street to Fountain Avenue from 5am to 5pm on Sunday. Norton Avenue is closed between Havenhurst Drive and Laurel Avenue from 5am to 5pm on Sunday. Holloway Drive is closed between Santa Monica Boulevard and La Cienega Boulevard from 5am to 5pm on Sunday. The good news is the city won’t be enforcing permit parking all weekend, but finding a free street spot will be a crap shoot and metered parking rules will be enforced. Several public lots around the neighborhood will be open but will be charging $20 to park. Taking an Uber or Lyft is probably your best bet (especially if you plan to imbibe at any of the area bars -- of which there is no shortage -- afterward). There isn’t a super-convenient Metro stop to the parade, but you could take the Red Line to the Hollywood and Vine stop (about 3 miles from the start of the parade route) and then grab a ride share from there. There sure is: #JUSTBE. Organizers say the theme honors the fact that everyone experiences Pride differently, and the hashtag is an invitation for participants to express whatever Pride means to them in an authentic way. Sounds good to us! Michaela Mendelsohn, LGBTQ+ activist and accomplished businesswoman (she’s CEO of one of the largest franchises for El Pollo Loco restaurants in the West) will serve as grand marshal this year. Mendelsohn is also the founder of TransCanWork, a program that promotes transgender inclusivity in the workplace. What performers will be there? Afterward, you can stick around catch a slew of acts beginning at 3:50pm on three different stages with performers including ‘90s songstress CeCe Peniston (7pm on the Boulevard stage), Latin pop star Natalia Jiminez (7:30pm on the Plaza Stage), and hip-hop performer Eve (8:25 on the Park Stage), all culminating with headliner Tove-Lo (9:40pm on the Park Stage). Note that the acts are part of the ticketed festival (located in West Hollywood Park and in the Pacific Design Center Plaza), so you’ll need to pay for a ticket. You can buy one in advance online, or at the door for $30 for a Sunday-only pass, but If you’re thinking of hitting up the festival on Saturday, too, it’s only 10 bucks more for full-weekend entry. Seniors, vets, and active military are charged just $15 for the whole weekend. 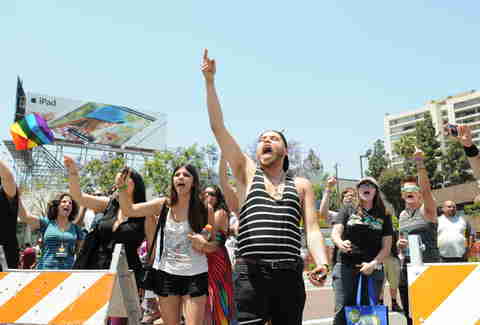 WeHo will reach a high of 82 on the day of the parade, and with fully sunny weather expected, you'll probably want to bring along some serious SPF. Don't forget to hydrate, either! How do I follow along on social media? Lizbeth Scordo is a food and lifestyle writer who hates every parade except for this one. Follow her on Instagram @modlizbeth and Twitter @lalizbeth.